Price fact: The price is 0.9 £ higher than the average over the last 10 weeks. 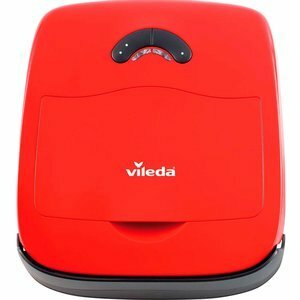 The Vileda VR101 Cleaning robotic vacuum cleaner is an affordable and versatile model that is designed to sweep and vacuum dirt and fine dust particles from a range of flooring. The VR101 features two unique cleaning programs, cliff sensors to avoid falling off stairs, and a removable dustbin. While this model might not come with any of the advanced connectivity and features of more expensive units, it provides an affordable and compact robotic cleaning solution. The Vileda VR101 Cleaning robotic vacuum cleaner ships with an 11V, 23W power supply. Battery life has been rated at 60-80 minutes by the manufacturer, with charging time rated at 5 hours. The sound level of this unit is very quiet at just 65dB, with two distinct cleaning programs used for small and large rooms. The VR101 robotic vacuum is a small and capable unit that can easily reach corners and fit under furniture. It comes with newly improved IR sensors that help it to detect and avoid stairs and other large drops, and a rubber bump bar for improved furniture protection and detection. The VR101 robotic vacuum has two cleaning programs: a full 60-minute program, and a much shorter 20 minute program. This unit features a removable and washable dustbin, extra filter, and durable maintenance brush. The Vileda VR101 Cleaning robotic vacuum cleaner is a lightweight unit at just 2.86kg, with product dimensions being 36.2 x 36.2 x 13.6cm. The dust capacity of this model is 250ml, with an 8.7cm height and 1cm climb ability. While this unit lacks some of the features of more expensive models, its long centre brush and dual cleaning programs are great for sweeping and dusting all kinds of hard floors and short-pile carpets or rugs. Read more about Vileda VR101 Robot Vacuum Cleaner her.